If you missed all the industry excitement yesterday, Microsoft launched a scroogled store on the Microsoft site. You can buy mugs, hats, hoodies and t-shirts with marketing slogans from Microsoft's anti-Google campaign - Scroogled. Although Microsoft cancelled the campaign, they just launched a store front to buy swag on the microsoftstore.com. 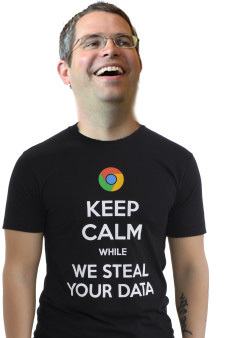 I doctored up on of the pictures to show how Matt Cutts may look wearing one of those t-shirts on his videos. In fact, I wouldn't be surprised if he does wear it in a future video - he would have fun with it. Struggling to find the right words for this. Astoundingly pathetic will do for now. I mean, does it get more desperate than that? Given the depths of lies and misrepresentations in their Scroogled campaign up to now, I probably should have expected something like this, but frankly I'm still rather surprised. There is a lot more feedback from Google in her comments and across all of Google+. Forum discussion at Google+ & Facebook.